Book Trump? Interest Groups Press Case at His Properties - Integration Through Media ....! (VOA): Payday lenders got regulators to rethink rules on how closely to vet borrowers. E-cigarette makers got a delay in federal oversight of many vaping products. Candy makers praised a decision to hold off on more stringent labeling standards. And title insurers declared "victory" for getting changes that benefited them in the tax overhaul. What do all these American special-interest groups have in common? They were among those that booked meetings, retreats and conferences at hotels and golf resorts owned by President Donald Trump. While it's impossible to draw a direct link between where groups seeking to influence the Trump administration hold their events and what they received, one thing is certain: Never before in American history have such groups had the opportunity to hold an event at a property owned by the president, paying for event space, rooms and food with money that ultimately heads into the president's pockets. An Associated Press analysis of the special interests that visited Trump properties in the first year of his presidency found several instances that at least created the appearance of "pay for play." And lobbying experts say as long as the president fails to divest from his businesses and can still profit from such bookings, special interests will take full advantage. "The name of the game is to have your message heard, and frankly, if you're helping put money in the family pocket, that's a good way of getting heard. And it's legal," said Bob Schneider, a former lobbyist who worked in Washington for 25 years. "If I were still doing that business, I would run to the Trump Hotel and have every event I could there," Schneider said, "because I can't imagine anyone believing that Donald Trump Jr. doesn't tell his dad what's going on with the business." Before taking office, Trump made a series of promises to draw a "red line" between his businesses and his administration. They included setting up a trust to hold his assets [which he can still access at any time], handing day-to-day management responsibilities to his two oldest sons and hiring an ethics lawyer to vet business deals. He also pledged to always act "beyond reproach" and never give "even the appearance of a conflict." In the first year of the Trump presidency, the watchdog group Public Citizen counted at least 19 interest groups that held events at Trump properties, including those representing miners, oil drillers, hedge fund operators, insurers, funeral home directors and commercial real estate investors. But it's difficult to know exactly how many such meetings were held and how much money those groups spent because, unlike political organizations or campaigns, interest groups are not required to reveal their expenditures at private facilities. And the Trump Organization declined to even discuss such meetings. Several special-interest groups contacted by the AP repeatedly said price, location and availability — not trying to influence public policy — were their primary reasons for booking with Trump. Government ethics watchdogs say that while these actions may be legal, they can cause the public to question some of the Trump administration's decisions. "There's a pretty big difference from lobbying and giving business to the president, which essentially means actually enriching the president," said Noah Bookbinder, executive director of Citizens for Responsibility and Ethics in Washington. "When you have these kinds of business relationships, it creates the risk that the president is instead going to be motivated by what's in his financial interest instead of what's in the best interest of the American people." A look at several special interests that met at Trump properties, their lobbying priorities, and the real-world results: Bankers Hedge fund managers, bankers and payday lenders have been opening their wallets at Trump properties. 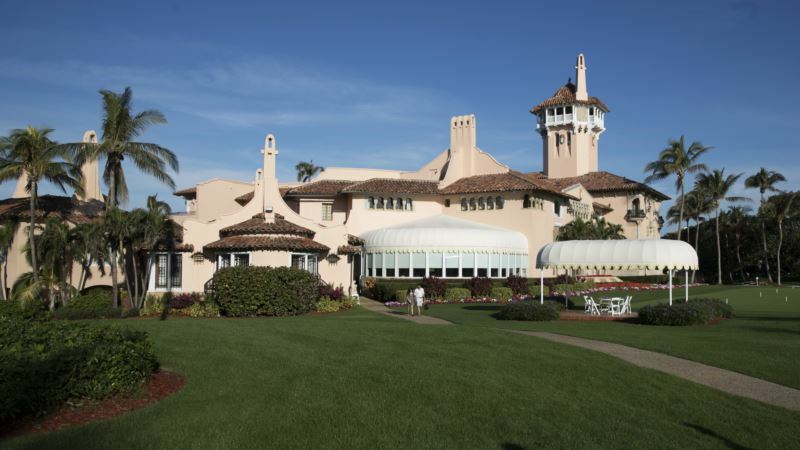 In March, the Palm Beach Hedge Fund Association, members of an industry that Trump once said were "getting away with murder" with tax breaks, held a meet-and-greet gathering at his Mar-a-Lago club in town. A few days later, executives from dozens of banks converged for a three-day conference at the Trump National Doral Miami that was sponsored by a trade magazine. Its panel discussions included one titled "The Trump presidency Next up, a payday lending group will be heading to the Doral in April for its annual conference. Trump administration goals often align with business groups, but those groups have nevertheless notched significant concessions from lawmakers and regulators in recent months. Federal regulators recently announced they would reconsider rules requiring payday lenders to make sure potential borrowers can pay back loans. And a law passed late last year will make it harder for consumers to join together to sue their banks. Also, the tax overhaul left open a loophole for hedge fund operators to claim much of their income as "carried interest" taxed at lower rates than ordinary income. But after Senate questioning, Treasury Secretary Steven Mnuchin said last week that he plans to close the loophole. Money manager Tom Brown, who spoke at the Doral event for bankers, said he didn't believe attendees saw it as an opportunity to curry favor with the Trump administration. For its part, the Community Financial Services Association, a payday lending group, said it first held an annual meeting at the Doral 16 years ago and added, "We look forward to returning." A board member of the Palm Beach hedge fund group, Jonathan Beaton, said it was a just a social club, not a lobbying organization. "No one is trying to get to Trump or change policy," he said. Vaping victory In July, a Washington-based trade association for the vaping and e-cigarette industry held its annual two-day conference at the Trump International Hotel in Washington. The keynote speaker was Sen. Ron Johnson, a Wisconsin Republican who had just written the Food and Drug Administration asking that it rein in a 2016 rule requiring e-cigarette makers get federal approval to sell the products, something the association says stunts innovation and places heavy costs on small businesses. Ten days later, the FDA announced that, as part of its efforts to strike the "appropriate balance" between regulation and innovation, manufacturers of e-cigarettes and cigars already on the market would have another four years before they would be required to get agency approval. The delay also applies to regulations on flavored vaping products, which studies show to be especially appealing to young people. Tony Abboud, executive director of the Vapor Technology Association, said in a statement that it was "overly simplistic" to suggest the July event at Trump's hotel had anything to do with the FDA delay. He said the venue was selected based on budget and proximity to Capitol Hill. Sweet success The lobbying group that represents "Big Candy" interests such as Mars and Hershey's held two events at Trump properties in the past two years — at the Doral in Miami in March 2017 and in 2016 at the Trump International Hotel in Washington. The group appears to have found receptive ears in the administration. In September, FDA Commissioner Scott Gottlieb proposed delaying Obama-era rules that would have imposed new labeling standards on candy. An official at the lobbying group, the National Confectioners Association, wrote Gottlieb a congratulatory letter, saying that the delay to January 2020 would "significantly reduce the burden" on the industry. Christopher Gindlesperger, a spokesman for the group, said the Miami event was booked in 2014, a year before Trump entered the presidential race, and the Washington event in 2015 before Trump became president. He added the group's use of Trump properties was based on its event needs only, adding that its choice of venues is "completely unrelated to our advocacy efforts." Title insurers A trade association for the title insurance industry has spent more than half a million dollars each year over a decade lobbying Congress and the White House. But never before has it had the opportunity to host an event at a property owned by a U.S. president. In October, the American Land Title Association held a three-day annual conference at Trump National Doral Miami, with rooms advertised to members at the rate of $279 a night. Two months later, ALTA wrote about a "significant victory" on its blog. The insurers sell more policies when people buy and sell more homes, but the initial versions of both the Senate and House versions of the tax overhaul would have hurt business by forcing home sellers to hold on to properties longer to claim tax-free capital gains on sales. The final law cut out those restrictions. Meanwhile, Trump said last month that he would look into another priority for the group, loosening rules on consumer lending. Representatives for ALTA did not respond to multiple requests for comment. Train training What do rules about training programs for railroad workers have to do with a dinner of sweet corn bisque, saffron paella and roasted rockfish accompanied by Trump wine from his Virginia vineyard and Trump Signature coffee? Well, maybe nothing, but it's worth watching. The backstory is that the National Railroad Association doesn't like a 2008 Transportation Department rule requiring what it considers excessive training for railroad workers. It has spent years trying to repeal it, spending $120,000 last year alone on lobbying on this issue and others. The Federal Railroad Administration had been authorized by Congress in 2008 to enact training rules, but a final rule had been repeatedly delayed. In March 2017, the association held a lavish dinner at the Trump International Hotel Washington down the street from the White House. "I am drinking Trump coffee," enthused one guest, Iowa Republican Sen. Chuck Grassley, who posted a photo of the menu on his Instagram account. The next day U.S. railroad executives and lobbyists fanned out to Capitol offices for their annual "Railroad Day" lobbying rounds. In December, the Federal Railroad Administration announced a proposal to delay implementation of its training rules for another year. The association did not respond to repeated requests for comment. The pop-in In at least once instance, Trump himself stopped by during a corporation's event at the president's exclusive Mar-a-Lago club. It came in December during the Christmas party for Oxbow Carbon LLC, a Florida-based energy company owned by William Koch, a longtime dues-paying member of Mar-a-Lago and brother of billionaires and conservative activists Charles and David Koch. Oxbow's main product, petroleum coke, a fuel used in oil refining and often stored in bulk, could be affected by the Trump administration's push to ease air and water pollution regulations. Oxbow spokesman Brad Goldstein said no business was discussed during Trump's visit to the party and stressed that Koch has long held events at Trump's club. "This was an event to reward Oxbow employees and the president was just visiting as he has in the past," Goldstein said. "It had nothing to do with public policy." This story has been corrected to reflect that the National Confectioners Association has met twice at Trump properties in the past two years, not in the past year. The most recent was March 2017 at the Trump National Doral Miami. The group also did not schedule another event at the Trump Washington hotel in September.